withdrawn in 1961The following is the text of an IBM Data Processing Division press fact sheet distributed on September 27, 1960. The IBM 7030 Data Processing System is the fastest, the most powerful and versatile in the world. It is now nearing completion at IBM's laboratories in Poughkeepsie, New York. The first system, the original STRETCH, is being readied for the Los Alamos Scientific Laboratory under contract to the Atomic Energy Commission. 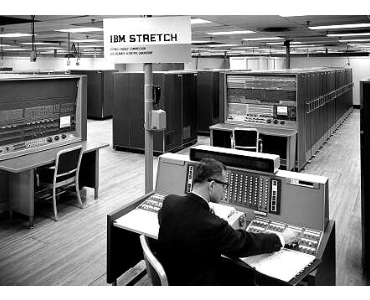 Custom-engineered IBM 7030 systems, based on STRETCH's technology, are being made available by IBM to industry and government under negotiated contract terms. Purchase price of representative systems is more than $10,000,000 with monthly rental of more than $300,000. IBM 7030 computers feature unrivaled speed, memory capacity, input-output flexibility, and multiprogramming capability. These solid state systems are extremely fast and efficient in solving large technical problems. Their general purpose design also provides facilities for high speed, flexible handling of variable field length data and decimal arithmetic for commercial data processing. An IBM 7030 system has ultra-fast transistors and circuit components. Data may be retrieved from magnetic core storage in only 2.18 millionths of a second. But it is the principle of simultaneous operation that gives the machine its truly great speed. For example, six core storage units may be operated at the same time, quadrupling the effective speed. This permits a continuous flow of 2,000,000 instructions and 2,000,000 pieces of data a second. The system has a new kind of random access magnetic disk storage. A disk unit holds ready for instant use, millions of words of alphabetic or numeric data. In only one second, more than 1,250,000 alphabetic characters can be read into or retrieved from the disk storage. Peak efficiency in the handling of input-output devices is provided by a specialized computer within the system called the Exchange. This acts as a switching center. It routes information between the main core storage and as many as 32 channels, each of which can handle many input-output devices. A high degree of overlap enables the main arithmetic unit to perform well over 1,000,000 logical operations per second. All sections of the central processing unit operate simultaneously. Another major new unit enables the computer to look beyond the work in process and prepare for tasks to come. This is the Look-Ahead, a device that anticipates instruction and data requirements - - greatly boosting the effective memory speed. The Look-Ahead acts as a reservoir, lining up instructions and data a fraction of a second before they are needed, to provide a continuous information stream to the arithmetic and logical unit. The IBM 7030 can also put aside what it is doing and turn in special tasks requiring immediate attention. For example, a lengthy aerodynamics problem could be temporarily interrupted for the quick processing of daily margin calls for stock brokerage firms - - or for trajectory computations of an earth satellite. The system can give priority to these calculations, while all other parallel functions continue without pause. The 7030 machines have magnetic tape units, card readers, punches, and printers, as well as other special devices -- all compatible with equipment on other IBM computers. A new set of generalized instructions developed for the IBM 7030 greatly simplifies the programming task. In addition, the system has more self-checking and self-correcting abilities than any other computer. Despite its tremendous speed and versatility, the system takes no more floor space than the IBM 704 (2,000 sq. ft.).